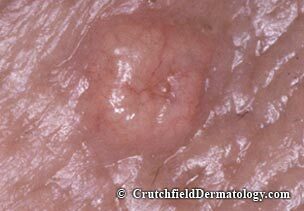 The Sebaceous Gland Hyperplasia Photographs are © copyright protected. Unauthorized use is prohibited. 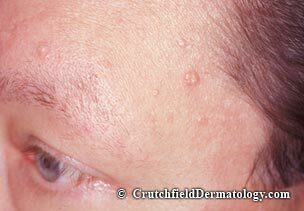 Sebaceous gland hyperplasia presents as small cream- to yellow-colored papules located, most notably, on the face. 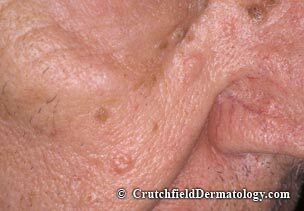 If you look at these lesions very closely and very carefully, you will notice that there is a central depression. Some have even described them as looking like very tiny doughnuts. Generally speaking, these lesions will increase in number over time. Rarely, some lesions have been reported to resolve on their own, but the vast majority tends to remain permanently. These represent an overgrowth of the sebaceous glands (oil producing glands) on the face. Their growth is associated with exposure to different androgen hormones and sun. 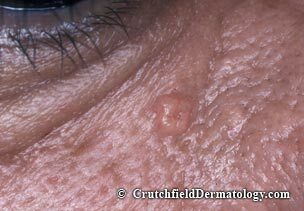 This explains why sebaceous hyperplasia is seen more commonly in men than in women, but it is still seen in all people. Sebaceous gland hyperplasia is a harmless condition that is only a cosmetic concern. It does not represent anything bad, such as skin cancer. 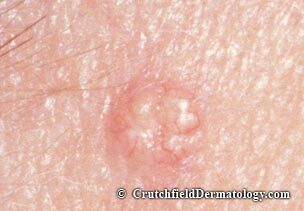 Some of the lesions, if extremely large in size and odd looking, may be evaluated for additional sebaceous gland disorders. Sebaceous gland hyperplasia can effectively be treated with a number of cosmetic procedures including minor surgery, liquid nitrogen freezing, and, most effectively, with laser therapy. For more information on the cosmetic treatment of these lesions, we would be happy to see you in consultation.